Customised Girl gift girls Give her a little Flower Girl gift of beautiful gorgeous personalized Bling Bling Necklace adorned with Ivory pearlround pave ball & rhinestones rings spacer. This can be Birthday Christmas or occasion gift for your little Girl. 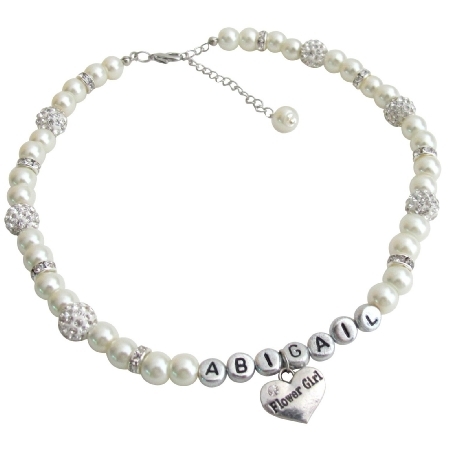 Customised Girl gift girls Give her a little Flower Girl gift of beautiful gorgeous personalized Bling Bling Necklace adorned with Ivory pearlround pave ball & rhinestones rings spacer. This can be Birthday Christmas or occasion gift for your little Girl. When you place order please email me for name pearl color & different charm like - Happy Birthday or Merry Christmas Or Little Or Big or Middle Sister Or Ring Bearer or any charm you would like specific. Please note that children under 3 years of age should only wear this bracelet with adult supervision. Buy Children Necklace Personalized Christmas Jewelry Ivory Necklace, sold & shipped by Fashion Jewelry For Everyone where you can shop online for Leading Online Retailer for Indian Fashion Jewelry. 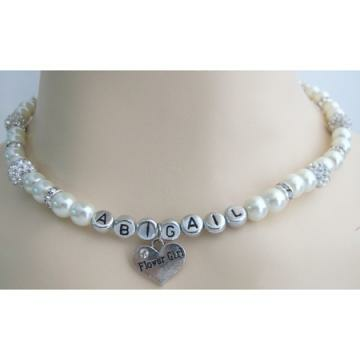 This Necklace Sets collection has been tagged as personalized jewelry, necklace, name jewelry, necklace, flower girl, charm jewelry, ivory pearl,handcrafted.